UPDATE: Due to unforeseen circumstances, the William Lustig director Q&A will be happening remotely rather than in person. Hoff’s Horrorfest is a monthly show at Brit Pack (3rd floor, 153 Lafayette, Manhattan) featuring stand-up comedy followed by a horror movie screening and, in this case, a director Q&A! It’s free and BYOB. This month’s installment will be at 9:30pm, Friday, April 24th. Seating is limited; RSVP to hoffmatthews@gmail.com. Oh boy, guys. This is exciting. 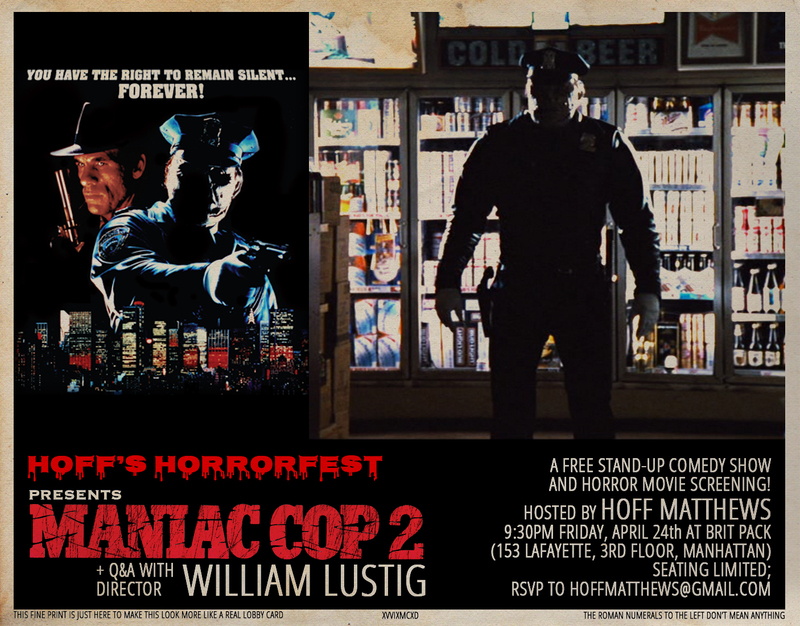 And as if that weren’t enough, we’ll be joined for a Q&A by William Lustig, director of the Maniac Cop films as well as of Maniac, Vigilante, Uncle Sam and many others. He’s a horror cinema icon and it’ll be a damn thrill to have him on the show. You have the right to remain speechless in the face of how much fun this is gonna be. Friday, April 24th! See you there! ← Hoff’s Horrorfest Presents: POLTERGEIST!